Having always lived in west, I have ventured only a handful of times to the east coast and sadly, to the mid west fewer still. When I finally get around to making THE road trip: ‘Around America for an Unspecified Amount of Time and Purpose’ (maybe a new title?) I will be sure to stop in Minnesota for a full throttle Jucy Lucy exploration. Minneapolis is the undisputed birthplace of this twist on the cheese burger ( it’s creator is not without controversy) and many variations from the original. Some restaurants have even taken this unpretentious dish to other levels by changing out the American cheese for Gruyere or blue or Swiss, others are using Kobe beef! Thumbs up for experimentation I say. Mixedsoup’s version is a combo of original Jucy Lucy and a ‘regular’ burger. 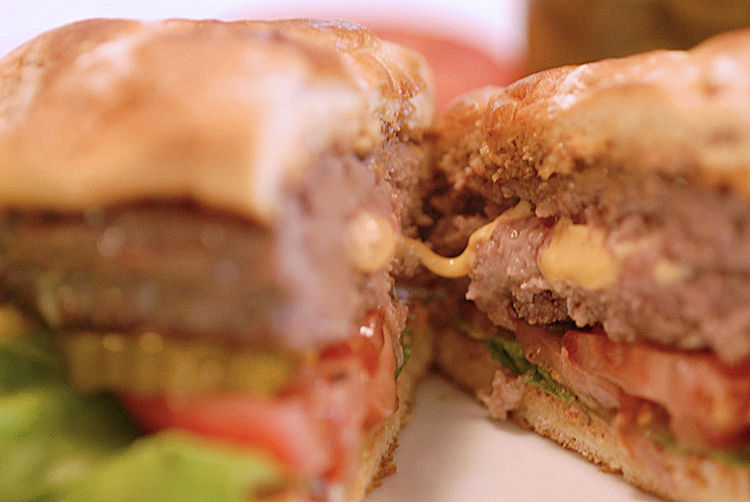 The Jucy Lucy does not come with lettuce or tomato like a regular burger or with any condiments. I like the flavors and textures of lettuce and tomato and all the ketchup, mustard etc. so I’ve included them. The cooking method is up to you, however I used a cast iron skillet this time. Make patties about 1/4 inch thick and about 4 1/2 inches in diameter. Thicker patties are difficult to cook through before the cheese has reached volcanic properties. Place the patties in the refrigerator for about 1/2 hour. 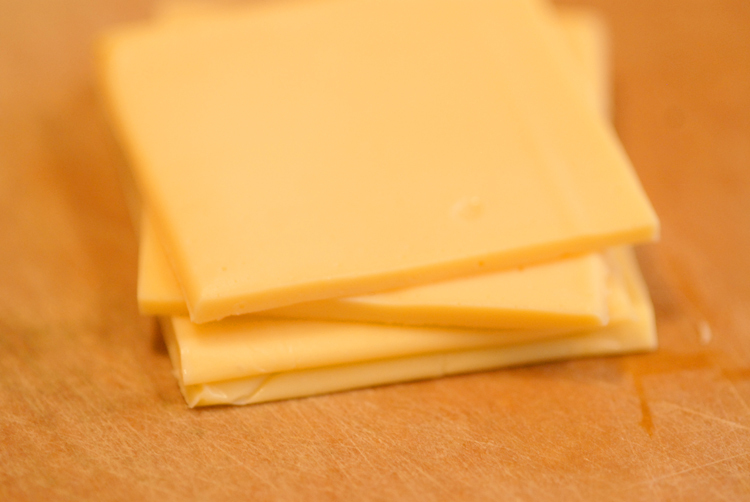 Take each piece of cheese and divide it into fours, then stack them into a pile four pieces high. Repeat with the other slices. Season each side of the patties with salt, pepper and garlic powder. 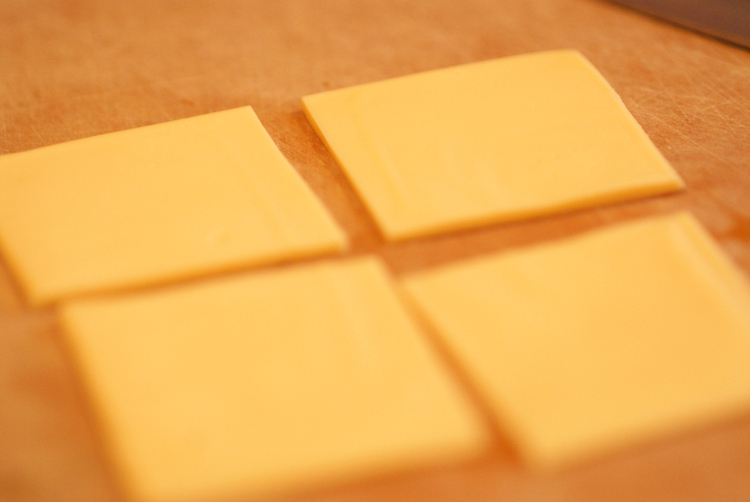 Take the four stacks of cheese and place each in the center of four patties. Take the other patties without the cheese and place them on top of the patties with the cheese stacks making a seal so that cheese doesn’t escape while cooking. One reason for using American cheese is it’s melting quality, although other cheeses may work well with a different effect. Preheat your pan over medium heat. Place the burgers in the pan and cover with a lid. After approximately 4 minutes turn the burgers and cover for another 4 minutes. If the patties begin to puff with moisture, prick with a skewer or toothpick to allow the steam to escape. Test for temperature using a instant read thermometer. Continue flipping and cooking until desired doneness. 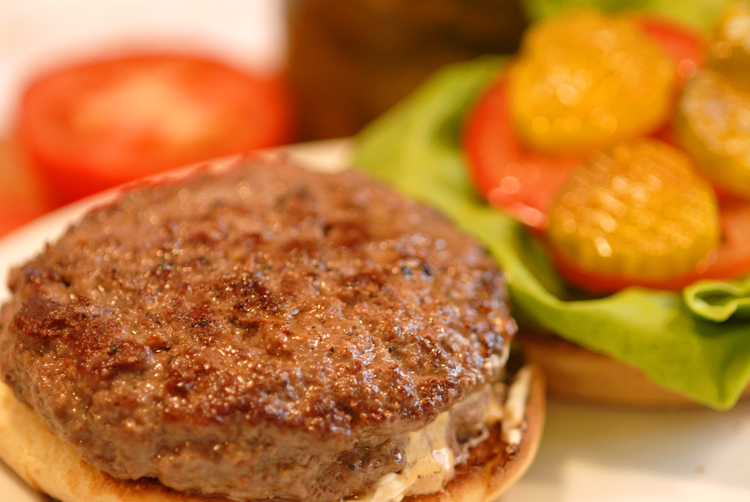 Let the burger rest for a few minutes before cutting or eating as the cheese may be molten. Grab lots of napkins! This entry was posted in entree, recipes and tagged BBQ, burger, lunch, meat by MixedSoup. Bookmark the permalink.